Lamborghini's Terzo Millennio (third millennium) concept uses supercapacitors to deliver high peak power and regenerate kinetic energy. Those looking for the next big thing in automotive battery technology would do well to follow the career of Ulrik Grape. The Norway-born executive has just been made CEO of French tech company NAWA Technologies, which wants to sell automakers ultracapacitor batteries. Given Grape's CV, the industry should be paying attention. Grape started out in the 1990s promoting lithium ion, first for use in portable electronic gadgets, then cars. As CEO of U.S. battery company Enerdel, Grape sold Volvo on the idea of lithium ion for the C30 limited-run production electric car and also signed a deal with ill-fated Norwegian EV maker Think. In 2013, he moved to California solid-state battery company SEEO, which was acquired by Robert Bosch in 2015. Solid-state technology has become the next big thing, with automakers such Volkswagen announcing plans to use it in its future EVs. Now NAWA Technologies reckons it has found a way boost the power of ultracapacitor batteries to the point car companies will be interested in those too. NAWA says its Ultra-Fast Carbon Batteries deliver five times the power of standard ultracapacitors. "This technology plays right smack into what the auto industry are looking for because there is a need to accept storage fast and deliver it fast," Grape told me. Ultracapacitor (also called supercapacacitor) batteries are strong on power delivery but weak on energy storage. Their use within automotive isn't new. PSA Group used a Continental system that incorporated ultracapacitors from Maxwell Technologies in 2010 for a stop-start system PSA called micro-hybrid. The swift burst of power that ultracapacitors deliver was used to restart diesel engines quickly. PSA still uses the technology. NAWA say its Ultra-Fast Carbon Batteries batteries can deliver between 30-100 times more power than lithium ion batteries, but a drawback is that they only store between 10-20 percent of the energy. So, Grape is proposing a hybrid system – ultracapacitors deliver a jolt of acceleration and quickly recoup energy lost slowing down and braking, leaving lithium ion to supply long-range energy. Because ultracapacitors can recharged over and over again without damage, they take the hard knocks of instant power and regeneration, extending the life of the lithium ion battery, or so NAWA's theory goes. "Teslas have a very large battery, we can deliver at least what they can on power and we can downsize the battery," Grape said. The company is targeting the premium European manufacturers first with the aim of full production in 2022. Lamborghini is one automaker looking at the potential of supercapacitors that can quickly deliver acceleration and recoup energy without wearing out quickly. The brand is working with the Massachusetts Institute of Technology to develop a system that it could use in its first full-electric supercar. 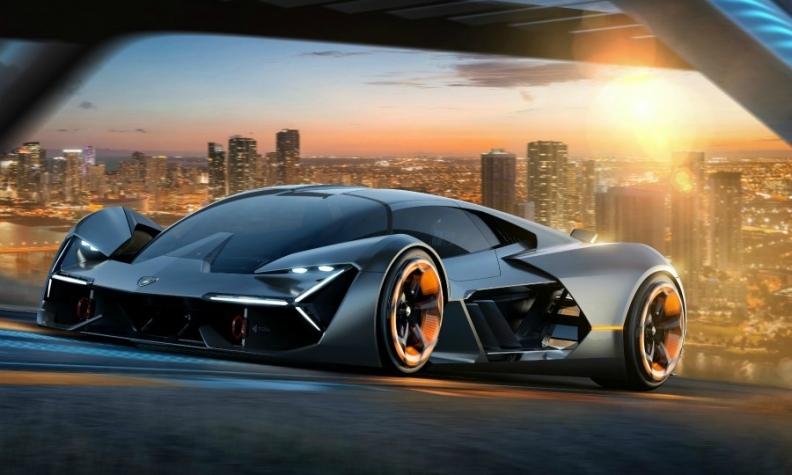 Lamborghini’s Terzo Millennio (third millennium) concept unveiled last week uses supercapacitors to deliver high peak power and regenerate kinetic energy. Lamborghini already uses low voltage supercapacitors in the V-12 Aventador. Lamborghini says its project with MIT aims to revolutionize energy storage by closing the gap on conventional batteries' energy density while "preserving the high power, symmetrical behavior and the very long-life cycle related to supercapacitor technology." NAWA, which was spun off from France's state-owned Alternative Energies and Atomic Energy Commission research organization in 2013, also believes it the battery technology could be used with 48-volt mild-hybrids, again providing the jolt of power. The technology might be expensive in terms of energy density, but the construction uses mostly carbon instead of rare-earth minerals and therefore has less of an environmental impact and is easily recyclable, Grape says. As more companies expand their electric vehicle programs, a hybrid combination of battery technologies could be the path to consumer acceptability, particularly if allowed EV drivers to accelerate hard without damaging range.